So, I have to at least explore some of the pet costumes out there. 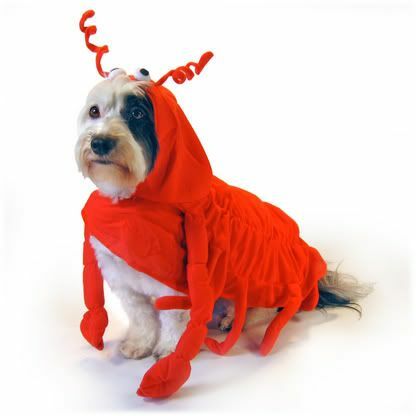 Also, I want you to be able to identify the expressions of pets who like their costumes and those who don’t. Take the first photo above, this dog is content in his Pimp Dog Costume. His mouth is open and he looks fine with the photo shoot. 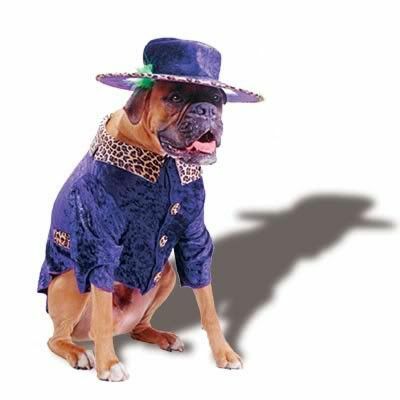 In a recent post with pictures of 2008 pet costumes–most of the dogs do not look happy. However in the 2007 collection of pet costumes the pooches are happier or at least tolerant. 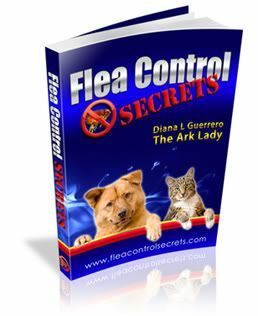 While I have you looking at other collections you’ll get a kick out of the Good Housekeeping collection of pet Halloween costumes and the new Halloween pet costume contest. 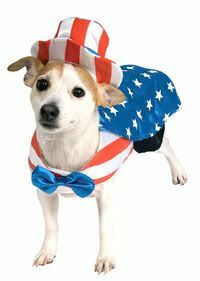 The dog in the Uncle Sam Patriotic Dog Pet Halloween Costume is alert and attentive–which is not how the dog in the Lobster Dog Halloween Pet Costume looks. In general, a happy dog will pant and have a good posture–or an alert one. My hiking partner, Shadow actually prances when she has her jingle bell collar on. She loves it and the attention she gets by wearing it around the holidays but she hates dressing up. 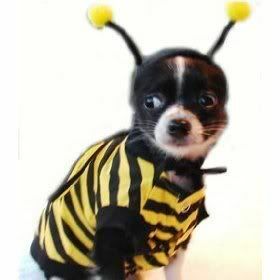 Below you can see the difference between the dogs wearing the Bumble Bee Halloween Dog Costume. The one on the right is happy about it while the one on the left isn’t. 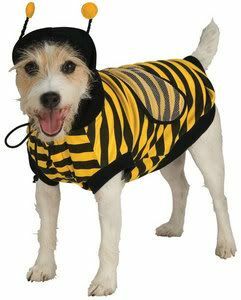 A large number of people will dress their pets up for Halloween but before you do so, remember that the important thing is to make sure your pet likes wearing a costume before you outfit your pet for Halloween. I’d like to know what your favorite pet Halloween costume is. Just leave your comment below.